123 Free Solitaire is a collection of 12 solaitaire games that you can play for free on pc. Furnished with soft template, graphics, and effects, this game promises pleasing moment especially if you are a fan of cards game. While opening it on the first time, you will face dialog box for selecting which type of solitaire you are going to play. For every card game, there are short descriptions such as number of decs, difficulty level, skill level, even chance of winning. Great info that makes us stuck a few seconds to compare info for all card games available before playing one of them. Some of the solitaires are common that you likely ever or maybe often played them. But some seems unknown. But 123 Free Solitaire let us know that there are many types of solitaire games from across the world. All of them are served for users to satisfy their need of entertainment. 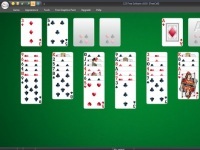 So, just give it a try and you will experience enjoyable solitaire with amazing graphics. Play Canasta card game against one up to five computer players. Classic spades inside nice 3D graphics and background music.